Another steal from Saveur/my "Recipes to Make" notebook. Threw it together in fifteen minutes today, and it was to die for. Didn't have a Chianti handy, so I used a bottle of Goats do Roam (reserving a glass for myself, of course), and it was just fine. 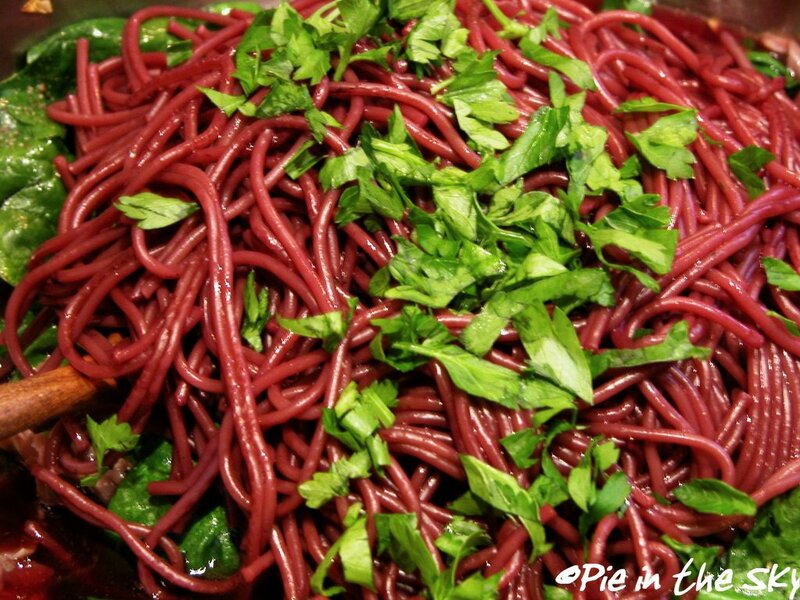 Be sure not to rinse the pasta after it's done - the winey tang on the noodles is delicious! Also, the prosciutto is quite salty, so salting during the cooking process is unadvisable. The red pepper gives it a wonderful bite. The recipe is so easy, and great for an impromptu fancy sunday night dinner. Enjoy! Add Chianti, salt and enough water to fill a large pot and bring to a boil. Add spaghetti and stir. Cook until al dente, about 8 minutes, stirring frequently. Add prosciutto or other ham and cook for another minute or two, until meat begins to sizzle. Add pepper flakes and cook a minute more. Toss in baby spinach and cook until totally wilted, about 2 minutes. Season with black pepper. When spaghetti is done, remove about 3/4 cup of the cooking liquid from the pot and reserve. Drain pasta but do not rinse. Add spaghetti directly to frying pan along with 1/2 cup or so of the reserved cooking liquid, enough to make a sauce. Add chopped parsley. Toss pasta in pan to distribute ingredients and simmer a minute or 2 until cooking liquid has almost all evaporated. Sprinkle with Parmigiano-Reggiano cheese and serve immediately. that's beautiful! i have never heard of cooking spag in red wine before - that's so cool. your pix are nice. My first visit to your blog - i'll be back! How are you doing? 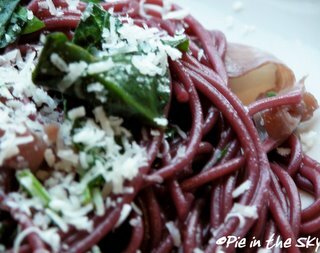 I just missed your blog for a while but hey, I can't keep up with you and your wonderful Tuscan Spaghetti dish is awesome...Why did it turn out red? I'm just curious-lol! Wow, that looks great. I'm all for quick dishes for weeknight meals. Thanks for sharing the recipe. Yum! This sounds great and in my quest for recipes that I have most of the ingredients (still poor) it sounds perfect! Thanks! I'm a Saveur reader too and although I haven't made very many recipes from them (same reasons as you!) the ones I have tried have been incredible - there was a cake with double devonshire cream and strawberry preserves that was divine and a fig and lemon jam that I love as well. I tried a key lime pie recipe a while ago from Paula Deen that was pretty good. Not perfect, but it might get better with a little tweaking. I'm a key lime pie lover myself! Thanks for this recipe and the inspiration! I made this last night and it was awesome!! 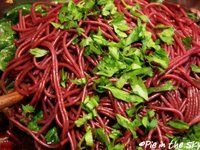 Definitely the most unusual pasta recipe I have come across in a long while! Thanks for sharing, and your pictures are beautiful. This was a great recipe! Certainly not an everyday choice, but wonderful for special occasions.